There is the graciousness of our God. He is parent and we are all his favoured children. He yearns to be loved as parent by us. If our God took the generous risk of creating us as free beings, and has resolved to respect our freedom, he has paid a heavy price. Most painful to God is our ungraciousness. We have consistently painted him - even when ostensibly honouring him - in unflattering and repellent colours. Although we are children of God we are, on the whole, rebellious children. Our Parent calls us, gently, insistently, to metanoia, to a wholehearted turning to him. God knows us so much better than we know ourselves. He is eager to forgive. He waits, invitingly, for our turning to him. He rejoices over one who repents. The talent entrusted to the servants is the largest currency unit of the time. (Precisely because of this parable, the word 'talent’ has taken on its familiar metaphorical meaning). The first two servants, by industrious trading, doubled the respective amounts received. The third, a man afflicted with 'prudence’, carefully hid his money. With his 'after a long time' (v. 19) Matthew denotes the delay of the parousia - the expected return of the Lord. The master (Kyrios is also 'Lord') returned and held a reckoning. The first two servants were congratulated and rewarded for their enterprise and fidelity. The reward of faithful and profitable service is greater responsibility and an acceptance into a more intimate relationship with the Lord. Though their responsibility had been unequal (five talents and two talents) their reward was the same (vv. 21, 23): what matters is wholehearted commitment, not accomplishment. 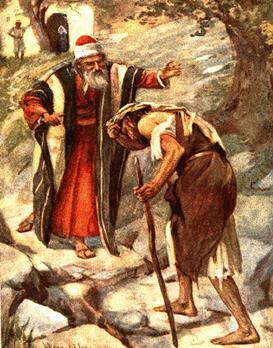 The third servant (the focus of the parable) received blame and condemnation - because he had done nothing. He had been too 'prudent' to take a risk. Punishment was for disuse rather than abuse of what had been entrusted. 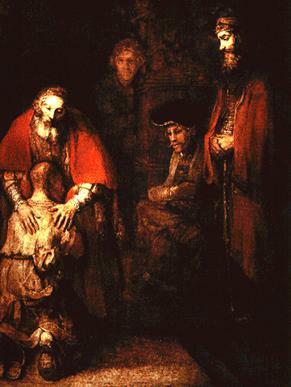 The servant's characterisation of the Master as 'a harsh man betrayed his manner of imaging God (quite like that of the elder son of Luke's parable: 'all those years I have been working like a slave for you, and I have never disobeyed your command' - Lk 15:29). One who images God so will strive to live within 'safe' parameters, will take no risk. The others had the confidence and the freedom to ‘trade'. They were not afraid of God. He was their loving Parent. Matthew would seem to be warning Christian leaders who portrayed God as an exacting taskmaster to the detriment of his loving Parenthood. The upshot is that the inactive servant loses everything. Likely, v. 29 was originally a cynical proverb to the effect that the rich get richer and the poor get poorer. In its present context it refers to human response to God's gift. One who commits oneself will receive generously; one who is ungenerous and selfish will end up losing what little one has. The warning is clear: a Christian who will not 'do' one's faith must lose out. In chapter 15 of his gospel, Luke tells how Jesus reacted to the complaint of the Pharisees and scribes that he 'welcomes sinners and even eats with them.' Jesus' reply was that he consorted with sinners precisely because he knew that God was a loving Father who welcomed the repentant sinner. The parables of the Lost Sheep and Lost Coin (parables for men and women) carry the message: God will rejoice over a sinner who turns to him. Both parables show from God's point of view, the conversion of a sinner: he rejoices because he can forgive. It is likely that the emphasis on repentance is Luke's qualification; Jesus was a friend of sinners. The story of father and sons is allegory: the characters being God, the sinner and the righteous. Jesus' Jewish hearers would have grasped the pathos of the young man's plight: a Jew herding pigs! He had hit rock bottom. What they would have found disconcerting was the incredible conduct of the father. That particular father represents a God eagerly looking for the first steps of homecoming. After that initial turning on the part of a sinner, the action is all his. Not a word of reproof. Stirred only by loving compassion, he embraced and kissed the lost one. All is forgiven. The son’s little speech is no longer a confession (as his rehearsed speech was meant to be); it is a spontaneous response to forgiveness. Best robe, signet ring, shoes: the youth is reinstated. He is son as though he had never left, had never gone astray. Nor is this the end. It is a moment to be savoured, a time for partying. Such is God's forgiveness, Jesus says. In contrast, the attitude of the elder brother was effective armour against the plea of vulnerability and the foolishness of love. He had never really known his father, and now he rejects his brother. The story ends with an invitation: the elder son is invited to acknowledge his brother and enter into the joy of homecoming. Only so will he know his father as Father. The story is open-ended; we do not know how the son responded. 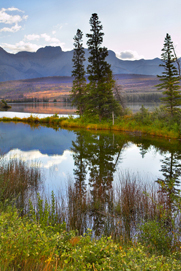 It is an example of the literary feature of unresolved conflict. Its purpose, is to involve the reader (or hearer). We are made to wonder how we would act. In effect, we must write the ending of the story. On many counts this is a disturbing story for us Christians of today. Luke took it out of the ministry of Jesus and addressed it directly to the 'Pharisees' in his own Christian community. And, surely, we must look to ourselves, to our possible resentment at God's graciousness to sinners. We can find comfort in the warm treatment of the younger son. Always, there is the father. He is the real challenge. Our gracious and forgiving God holds the stage. This story persuasively shows God's loving concern for humankind and, in particular, his favouritism towards the outcast. It sets a question-mark against the theology of forgiveness reflected in much of our penitential practice. God's forgiveness seems too good to be true. Above all, there is the uncomfortable message that one really comes to understand this Father only by acknowledging the brother and sister as brother and sister - a lesson learned by the author of 1 John: 'Those who do not love a brother or sister whom they have seen cannot love the God whom they have not seen' (4:20). The allegorical features of the parable of the Wicked Tenants (per- haps better named the Beloved Son) are evident: the vineyard is Israel, the owner is God, the maltreated servants are God's messengers to Israel, notably the prophets; the beloved son is Jesus. The description and equipping of the vineyard are based on the allegory of Isa 5:1-7 which represents Israel as the vineyard of the Lord. Mark's significant modification is to have the landlord let out his vineyard to tenants. It follows that failure is not on the part of the vineyard (the people) as in Isaiah; it is the failure of the tenants, the leaders of the people. The landlord sent his servants to collect the rent, only to have them insulted and maltreated, even killed. He decided to play his last card. He had a beloved son, his only son. He would send him: 'Surely, they will respect my son!' But they killed him and, contemptuously, left him unburied. So had God dealt with an obdurate people, sending to them, again and again, his servants the prophets. And now, supreme graciousness, he has sent his only Son. This was the ultimate challenge. But the tenants, the leaders, made away with him. Jesus' rhetorical question in v. 9 - 'What will the owner of the vineyard do?' - gives punch to the parable, pointing to judgement on faithless Israel. Whenever, as here, there is question of the alleged rejection of Israel, one must keep in mind the conviction of Paul who, after all, as a fellow Jew, had special affinity with Jesus of Nazareth, that all Israel will be saved' (Rom 11:26). Why? On the basis of an impeccable biblical argument: 'The gifts and the calling of God are irrevocable' (11:29). It is a matter of supreme importance that this parable appears in all three synoptic gospels shortly before their passion narratives. It is a wholly clear indication of how they understood 'he did not withhold his own Son’ (Rom 8:3-2). The Father had not thrown his Son to the wolves. The Father had not wished the death of his Son. Father and Son had delivered themselves to the humans they would save. Jesus did not die - Jesus was killed. It was not the Father who killed Jesus. This is Matthew's great scene of the Last Judgement. Strictly speaking, this is not a parable - apart from vv. 32-33. It is closer to an apocalyptic vision - such as Rev 20:11-15. Yet it can fittingly conclude our brief study of gospel parables because it illustrates the nature of God's rule and, paradoxically, highlights his mercy. The Son of Man is emphatically a king who sits in judgement. Perhaps largely through the influence of this passage the image of Christ as Judge has had a profound impact on Christian tradition - an unhappy impact. This image of Christ is far from being the dominant one in the New Testament - he is, rather, advocate and mediator. Even here, when one looks closely, it will be seen that judgement is 'auto-judgement': we judge ourselves by our omissions or our deeds. Rightly to appreciate this passage one must understand that it is retrospective. Matthew has in mind how Jesus comported himself - how he related to people. What Jesus did and said becomes the standard of judgement. He had come, a human being, into our human history, to tell us of the goodness of God. Jesus taught and lived that the reality of God is revealed in the realisation of more humanity between fellow human beings - giving drink to the thirsty, feeding the hungry, welcoming the stranger. Matthew’s story of judgement is focused on purely human concerns. But these are God's concern: 'Come, you blessed of my Father. 'The emphasis is on the needy person, the one in distress. What is at stake in this last judgement is our attitude towards the little ones, the humble and the needy. The criterion is not the standard of religion or cult; it is, starkly: has one helped those in need? The scene is vivid. Mixed flocks of (white) sheep and (black) goats were a common sight in Palestine. Here sheep and goats separate for final blessing or curse. The King of the heavenly kingdom sits in judgement on his people. The good works of vv. 34-36 are the traditional 'corporal works of mercy' and the elect have performed these works. Their surprise, their amazement, is in being told by the King that they had done them 'to me.' Astounded, they ask: 'When? ... when?... when ... ?' The answer is Jesus' solemn attestation of his total identification with the poor and the outcast and oppressed. It might seem, at first sight, that this Matthean scene has nothing specifically Christian about it. But when we realise that the comportment of Jesus himself is the yardstick of judgement, we can see how thoroughly Christian it is. And this is so even though it embraces 'all the nations' - all people without distinction (25:32). The truth is that the King who is judge of all is the crucified King and he is met in every one who suffers. The 'goats' had failed to minister to him because they had not loved the poor in concrete deeds of mercy. This Jesus, the crucified one, is the Son of man who utters judgement - but what kind of judgement is this? He is the one who identifies himself with the lowly - with all the daughters and sons of men. He is the loving and living expression of God's concern for humankind. A God bent on humankind, and nothing short of that, becomes the standard of our concern for those in need. That is why just this concern is the criterion of judgement. That is why the words of warning sound so harshly. Can one really believe that the Jesus who, on the cross, prayed: 'Father, forgive them; for they do not know what they are doing' (Lk 23:34) - the 'they' being the Romans who crucified him and the obdurate chief priests and their allies - could now, as Risen Lord, declare, 'You are accursed, depart from me'? What matters is that we should see that seemingly irrevocable sentence against what we know of the God of the Old Testament and of the New. This is the wondrously inconsistent God who 'grieves to his heart' that he had ever made this complicated and stubborn human creature (Gen 6:5-8); the God whose mother-heart 'recoils' at the prospect of losing Ephraim (Hosea ix:8); the God who desires the salvation of all (I Tim 2.40), the God who did not spare his own Son Un 3:16). Surely Jesus would have us believe that his God loves us with divine love beyond our human imagining. Nothing of this is lost when one realises that the Last Judgement is myth. Though presented in the guise of an historical event, one must recognise that its value is symbolic. One is challenged to live in such a way that, should it occur, one would not be caught unawares. The 'last judgement' is warning: it primarily relates to one's conduct in the present. While the King stresses his solidarity with 'all,' the exhortation is, by Matthew, addressed to Christians. We are being taught how we should prepare for the 'coming’ of the Lord - prepare for our meeting with him. And if we take the warning to heart we may be able to declare with Paul: 'My desire is to depart and be with Christ, for that is far better (Phil 1:23).